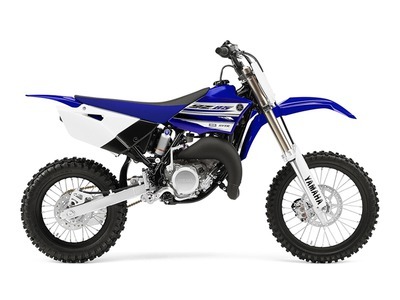 2016 Yamaha YZ85, 2016 Yamaha YZ85 Mini Ready to Race right out of the Crate The mini race bike of choice for future champions with its high performance, 2-stroke engine, top shelf suspension and durable Yamaha 2-stroke engine. Features May Include: Modern Styling Aggressive, modern styling includes the front fender, number plate, radiator shroud and side number plates. Adjustable Controls Clutch lever reach adjuster to accommodate smaller hands for younger riders. Compact Two-Stroke Powerplant Liquid-cooled, 85cc crankcase reed-valve-inducted six-speed is light, compact and designed to deliver hard-hitting, moto-winning power throughout the rpm range. Close-Ratio Transmission Smooth-shifting, six-speed close-ratio transmission with heavy duty multiplate clutch delivers maximum hookup for outstanding acceleration and corner-exiting power. Strong, Compact Frame Ultra-rigid, single-backbone, semi-double-cradle frame is lightweight and strong for sharp handling. Race-Ready Suspension Fully adjustable suspension allows a broad adjustment range to suit everybody from rank novice to mini expert.